An SUV rolled off the road and landed in this driveway in unincorporated Redwood City (July 31, 2016). The San Mateo County Sheriff's Department has a man in custody after an SUV drove off the road and nearly landed on a house in unincorporated Redwood City. 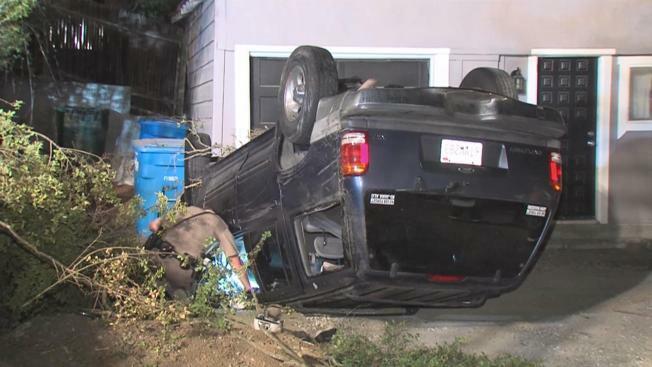 The accident happened just after midnight Sunday morning when the SUV rolled off the road and fell several feet, landing upside down in the driveway of a home on Hillside Road in the Emerald Hills neighborhood, sheriff's officials say. The driver suffered minor injuries and was taken into custody after sheriff's officials completed a sobriety test. Sheriff's officials say bottles of alcohol were found on the ground near the SUV.